Corita Kent (November 20, 1918 – September 18, 1986), born Frances Elizabeth Kent and also known as Sister Mary Corita Kent, was an American Roman Catholic religious sister, artist, and educator. She worked almost exclusively with silkscreen, also known as serigraphy, pushing back the limitations of the two-dimensional medium by the development of innovative methods. Kent's emphasis on printing was partially due to her wish for democratic outreach, as she wished for affordable art for the masses. Her artwork, with its messages of love and peace, was particularly popular during the social upheavals of the 1960s and 1970s. After a cancer diagnosis in the early 1970s, she entered an extremely prolific period in her career, including the Rainbow Swash design on the LNG storage tank in Boston, and the 1985 version of the United States Postal Service's special Love stamp. In recent years, Corita has gained increased recognition for her role in the pop art movement. Critics and theorists previously failed to count her work as part of any mainstream "canon," but in the last few years there has been a resurgence of attention given to Kent. As both a nun and a woman making art in the twentieth century, she was in many ways cast to the margins of the different movements she was a part of. Corita's art was her activism, and her spiritually-informed social commentary promoted love and tolerance. Frances Elizabeth Kent was born in Fort Dodge, Iowa in 1918. Upon entering the Roman Catholic order of Sisters of the Immaculate Heart of Mary in Los Angeles in 1936, Kent took the name Sister Mary Corita. She took classes at Otis (now Otis College of Art and Design) and Chouinard Art Institute and earned her BA from Immaculate Heart College in 1941. She earned her MA at the University of Southern California in Art History in 1951. Between 1938 and 1968 Kent lived and worked in the Immaculate Heart Community. She taught in the Immaculate Heart College and became the chair of its art department in 1964. Her classes at Immaculate Heart were an avant-garde mecca for prominent, ground-breaking artists and inventors, such as Alfred Hitchcock, John Cage, Saul Bass, Buckminster Fuller and Charles & Ray Eames. Kent credited Charles Eames, Buckminster Fuller, and art historian Dr. Alois Schardt for their important roles in her intellectual and artistic growth. By the early 1950s, she had such a unique and well-known aesthetic and teaching style that clergy members from all over the country were sent to be educated at Immaculate Heart College. Her students were drawn to her selflessness and unique teaching methods such as large class assignments like asking students to create 200 drawings or take three hours to draw their arm without looking at what they were creating. She toured widely the following decade. After the Second Vatican Council, Kent transformed Immaculate Heart College’s annual Mary’s Day procession into a community celebration which was part of the sister’s campaign to bring secular people together. During this time, Kent’s work became increasingly political, addressing events such as the Vietnam War and humanitarian crises. For example, she was commissioned by the Physicians for Social Responsibility to create what she called “we can create life without war” billboards. 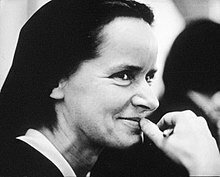 Tensions between the order and church leadership were mounting, with the Los Angeles archdiocese criticizing the college as “liberal” and Cardinal James McIntyre labeling the college as “communist” and Kent’s work as “blasphemous.” Due to this, Kent returned to secular life in 1968 as Corita Kent. Most sisters followed suit and the Immaculate Heart College closed in 1980. In 1985, Kent’s design for a United States Postal Service Stamp is issued. She did not attend the unveiling because she wanted it to happen at the United Nations and was not happy with the message that was sent when the design was unveiled on the Love Boat. Her 1985 work "love is hard work" was made in response. The stamp itself sold successfully- over 700 million times. After she left the order, she moved to Boston, where she devoted herself to making art. Her split from the Immaculate Heart Community was emotional and difficult for her, since her religious faith was a central element of her life for decades. Corita Kent was diagnosed with cancer in 1974. After this diagnosis, in the Back Bay of Boston, Kent confined her art to water color painting and only pursued printmaking if it was in order to say something substantiative. She died on September 18, 1986 in Watertown Massachusetts at the age of sixty-seven. She left her copyrights and unsold works to the Immaculate Heart College Community. Kent created several hundred serigraph designs, for posters, book covers, and murals. Her work includes the 1985 United States Postal Service stamp Love and the 1971 Rainbow Swash, the largest copyrighted work of art in the world, covering a 150-foot (46 m) high natural gas tank in Boston. Kent was also commissioned to create work for the 1964 World’s Fair in New York, and the 1965 IBM Christmas display in New York. Her 1951 print, The Lord is with Thee had won first prizes in printmaking at the Los Angeles County Museum of History, Science, Art, and at the California State Fair. By the 1960s, Kent had already shown work at 230 exhibitions across the country and her work was included in the collections of the Museum of Modern Art, the Los Angeles County Museum, and the Metropolitan Museum of Art. Corita Kent worked at the intersection of several powerful and at times contradictory cultural, political, and religious influences. 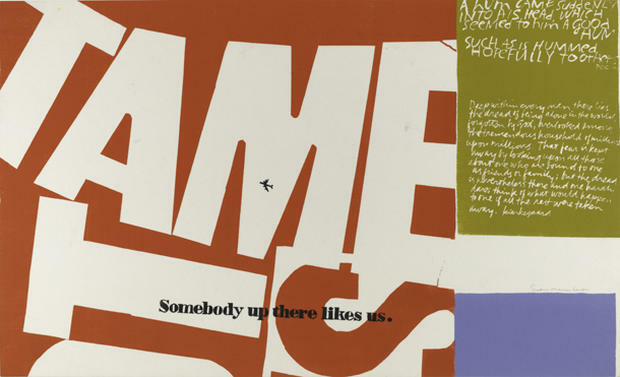 Corita Kent, inspired by the works of Andy Warhol, began using popular culture as raw material for her work in 1962. Her screen prints often incorporated the archetypical product of brands of American consumerism alongside spiritual texts. Her design process involved appropriating an original advertising graphic to suit her idea; for example, she would tear, rip, or crumble the image, then re-photograph it. She often used grocery store signage, texts from scripture, newspaper clippings, song lyrics, and writings from literary greats such as Gertrude Stein, E. E. Cummings, and Albert Camus as the textual focal point of her work. E.E. Cummings was one of her earliest and strongest influences. She quotes him in her work separately more than a dozen times and was inspired by a line from one of his lectures to create an entire series of alphabet prints. In her 1966 piece Tame It's Not, she uses quotes from Winnie the Pooh, Kierkegaard, and an ad slogan for men's cologne. By creating juxtaposition between formally acknowledged or respected "art" and the art Corita saw in her everyday world – at the supermarket, on a walk, in the classroom – she lovingly elevated the banal to the holy. “Like a priest, a shaman, a magician, she could pass her hands over the commonest of the everyday, the superficial, the oh-so-ordinary, and make it a vehicle of the luminous, the only, and the hope filled,” noted Corita's friend, theologian Harvey Cox. Corita's earliest work was mostly iconographic, drawing inspiration and material from the Bible and other religious sources. Her style is heavily text-based, scripture passages or positive quotes often encompassing entire compositions with bold and highly saturated typefaces. Despite the often surreal or disorienting compositions of her works, her pieces are "always about something." By the 1960s, her work started becoming increasingly political. For example, her silkscreen print, stop the bombing(1967) is a large piece protesting the use of nuclear weaponry in bold, blue letters against a white and red background. Kent produced her oeuvre during her time at Immaculate Heart College in Los Angeles in response to the Catholic reform in the 1960s by the Vatican Council II as well as several political and social issues happening at the time. Her work itself aided in the Vatican II movement, a movement to modernize and make relevant the Catholic Church. Kent’s use of English church texts in her work, for example, made an impact on the Vatican II’s efforts to normalize conducting Mass in English. Because of her strongly political art, she and others left their order to create the Immaculate Heart Community in 1970 to avoid problems with their archdiocese. Infused through her work, evident in the colors she chooses and the sources she quotes from, is an intense faith; whether her faith is in the holy or the human is immaterial, because her art itself strives to reveal the beautiful conflation inherent in the two. Corita’s art has at times a haphazard quality to it – her handwriting is messy and sometimes illegible, the printed words bend and fold on themselves, the colors splash into each other. Her aesthetic is contingent on screen-printing as the overlap between precision of printing – for the typed letters – and freeform of color and shape is accentuated by screen-printing. Kent’s work invites creativity from others, clearly marking her sources of inspiration and her process along the way of her production. The “Big G” logo that Kent appropriated from General Mills was to stress the idea of ‘goodness’, while the elements from Esso gasoline ads were meant to project the internal power within humans. Unsurprisingly, a Christian subtext does underscore several of her artworks, but not all, which are open to interpretation. One of Kent’s prints, love your brother (1969), depicts photographs of Martin Luther King Jr. overlaid with her handwritten words, “The king is dead. Love your brother,” outlining one of her more serious artworks, and presenting her views on politics and human nature. Her collages took popular images, often with twisted or reversed words, to comment on the political unrest of the period, many of which could have been found at any number of marches or demonstrations, some of which she attended herself. Some recent solo exhibitions of Kent's work include: Someday is Now: The Art of Corita Kent at the Tang Museum at Skidmore College, There Will Be New Rules Next Week at Dundee Contemporary Arts, and R(ad)ical Love: Sister Mary Corita at the National Museum of Women in the Arts. Corita Kent's papers are held at the Schlesinger Library, in Radcliffe Institute, Harvard University. Corita Kent received the American Institute of Graphic Arts Medal in 2016. Corita Kent's work is held by several art museums and private collectors including The Whitney, Museum of Fine Arts, Boston, and The Metropolitan Museum of Art in New York. ^ a b c d Dammann, April (2015). Corita Kent: Art and Soul. The Biography. Santa Monica, California: Angel City Press. pp. 10–92. ISBN 978-1626400207. ^ Kurhi, Eric (2011-02-14). "Work of pop art icon Corita Kent coming to Hayward, Castro Valley galleries". Oakland Tribune. Retrieved 2014-11-25. ^ Winick, Les (1985-04-07). "Usps Sends Its Fourth Message Of Love To Avid `Special Regular`". Chicago Tribune. Retrieved 2014-11-25. ^ a b c Eye, Number 35, Volume 9, Spring 2000. ^ a b "Corita Kent, Warhol's Kindred Spirit in the Convent". The New York Times. 2015-04-10. ISSN 0362-4331. Retrieved 2016-06-26. ^ Tigerman, Bobbye. Handbook of California Design. Cambridge, Massachusetts; London, England: The Los Angeles County Museum Art and The MIT Press. pp. 142–143. ISBN 0262518384. ^ "Corita Kent oral history transcript". Archives of American Art. Oral History Program, University of California, Los Angeles. 1977. Retrieved 2014-11-25. ^ a b c d e f g h Svendsen, Jessica. "The Corita Art Center". Corita.org. Retrieved 2017-03-11. 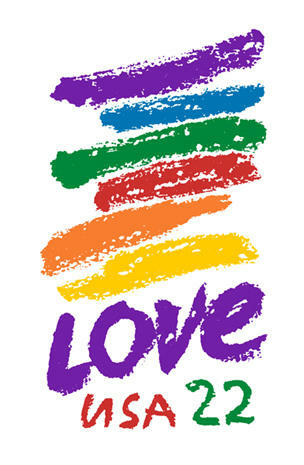 ^ "Tang hosts retrospective of artist, activist, and educator Corita Kent". Skidmore College. Retrieved 2014-11-25. ^ a b c "An Artist Who Sees Holiness in Wonder Bread". The Getty Iris. 2015-08-27. Retrieved 2017-03-11. ^ a b "The tumultuous times of Corita Kent". National Catholic Reporter. 2016-08-03. Retrieved 2017-03-11. ^ a b Kennelly, Karen M. (2004). KENT, Corita. November 20, 1918-September 18,1986. Cambridge, MA: Harvard University Press. ^ "Love (1985)". Smithsonian National Postal Museum. Retrieved 2015-06-26. ^ Phillip Martin (2001-11-03). "Wartime Visions". National Public Radio. Retrieved 2015-06-26. ^ Axell, Evelyne, and Angela Stief. "Sister Corita." Power up - Female Pop Art: Evelyne Axell, Sister Corita, Christa Dichgans, Rosalyn Drexler, Jann Haworth, Dorothy Iannone, Kiki Kogelnik, Marisol, Niki De Saint Phalle; Kunsthalle Wien, 5. November 2010 Bis 20. Februar 2011, Phoenix Art. Köln: Dumont, 2010. 151. ^ "Someday is Now: The Art of Corita Kent". www.warhol.org. Retrieved 2018-02-10. ^ "Corita Kent". www.corita.org. Retrieved 2016-04-02. ^ a b Newhouse, Kristina (2000). "Sister Corita, David Moffett: UCLA Hammer Museum, Los Angeles". Artext: 87. ^ a b "Corita Kent: Footnotes and Headlines Exhibition | Radcliffe Institute for Advanced Study at Harvard University". www.radcliffe.harvard.edu. Retrieved 2017-03-11. ^ a b c Pagel, David (February 22, 2000). "Art Review; Sister Corita's Edgy Optimism Endures in Two Exhibitions". Los Angeles Times. ^ Kilston, Lyra (2010). "Sister Corita Kent: Zach Feuer". Art in America: 124–125. ^ a b Dackerman, Susan. ""AIGA Medalist: Corita Kent: Biography"". aiga.org. American Institute of Graphic Arts. Retrieved November 30, 2016. ^ "Someday Is Now: The Art of Corita Kent". 2010-05-15. Retrieved 2014-11-25. ^ "There Will Be New Rules Next Week". Dundee Contemporary Arts. Retrieved 2014-11-25. ^ "R(ad)ical Love: Sister Mary Corita". National Museum of Women in the Arts. 2012-03-08. Retrieved 2014-11-25. ^ "Corita Kent: Who Came Out Of The Water". Whitney Museum of American Art. 1966. Retrieved 2014-11-25. ^ "Sister Mary Corita Kent". Museum of Fine Arts, Boston. Retrieved 2014-11-25. ^ "Corita Kent - The Beginning of Miracles". Metropolitan Museum of Art. Retrieved 2014-11-25. ^ a b "Benezit Dictionary of Artists". Retrieved June 26, 2016. ^ "Let the Sun Shine In – A Retrospective, February 22 until May 24, 2014". Circle Culture Gallery. 2014. Retrieved 2014-11-25. ^ "Morris and Helen Belkin Art Gallery | Beginning with the Seventies GLUT". belkin.ubc.ca. Retrieved 2018-03-11. ^ "Ditchling Museum of Art and Craft | Get with the Action". ditchlingmuseumartcraft.org.uk. Retrieved 2018-07-05. "Corita, 1918-1986. Papers of Corita, 1936-1992 (inclusive), 1955-1986 (bulk): A Finding Aid". Schlesinger Library. Radcliffe Institute for Advanced Study. "Interview of Corita Kent". UCLA Library, Center for Oral History Research. 1977. Stevens, Peter F. (2004-08-19). "Did She Or Didn't She? Only Artist Corita Kent Knew Whether the Image of Ho Chi Minh Was Emblazoned on Dot's Gas Tank". Archived from the original on 2012-02-04. "Sister Corita". Weekend America. NPR. 2007-03-03. Archived from the original on 2008-05-09.